Today we celebrate the Feast of the Baptism of the Lord. It is fitting to begin our new journey of St. Brendan’s Church by rehearsing the event that inaugurates Jesus’s public ministry. As we seek to follow Christ, we remember and reflect on His baptism, His obedience, and His humility. The story starts with John the Baptist: a voice crying out. Away from the city of man, from grind of human strife, of political corruption, of religious manipulation, a voice echoes across the barren landscape. From the wilderness at the edge of the Jordan River, John cries out, “Repent. Turn around. Behold. The Kingdom of Heaven is at hand.” The old systems, the old powers, the old oppressions are all passing away. The Kingdom is at hand and all things will become new. As John cries out, he baptizes. Inviting people into the Jordan, into the path of Israel’s forefathers who followed the Lord through the wilderness and crossed the Jordan to enter the Promised Land. John’s baptism is a baptism of repentance, of rehearsing the promises of God, of returning to the original call to the children of Israel. John knows that these waters also point to Another who is coming: to One who will usher the Kingdom of Heaven. As John speaks of the One who is to come, he says, “I am not worthy to carry his sandals.” The sandal covers the very lowest part of a person. Only a servant might clean the feet and touch the sandals. John says that he is not even worthy to carry the sandals. Though John baptizes with water, the One who is coming will baptize with fire and Spirit. The One who is coming brings the fire of God’s Spirit upon His people, upon the world. This fire of love is purifying, transforming, glorifying. Think of the fiery tongues descending upon the disciples in the upper room. St. Gregory Nazianzus said that “we are heirs of light and fire.” The Coming One is raising up a people of fire, a people of Spirit, a people of Glory. As John proclaims the coming One. 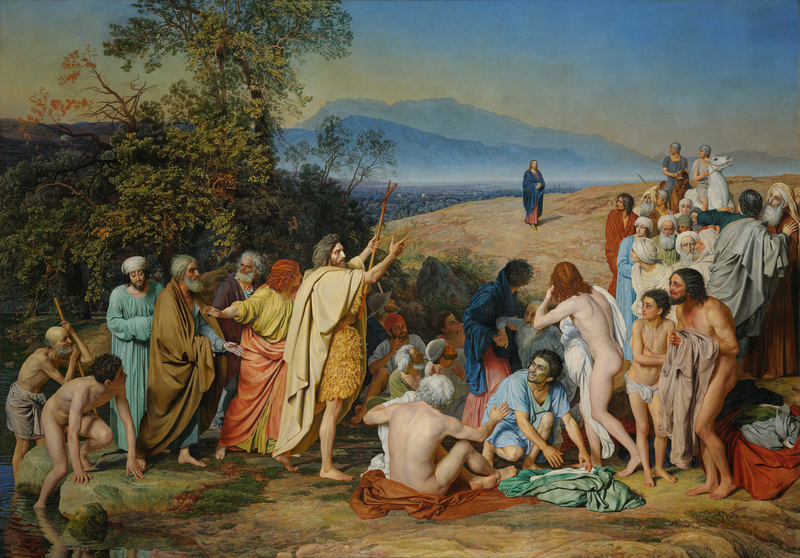 As we reflect on this strange reversal where the Jesus submits to John in baptism, I thought it might help us to reflect on a painting of the Baptism by Alexander Andreyevich Ivanov. In his story, I see the rhythm of humiliation and the movement of death and life as seen in the baptism. He came from a family of artists and his father was an art professor. In the early 1830s, Ivanov had already made an impact on the Russian art world. He was convinced that art had a prophetic responsibility to enlighten culture and lead people to truth. He shared this conviction with the great Russian writer, Nikolai Gogol who became one of his greatest defenders. In 1933, Ivanov got an idea for a painting about the baptism of Jesus but didn’t actually start working on the painting until 1938. This work would take him to Italy to study landscapes and people. But progress was slow. Eight year after beginning, the painting was still incomplete and Ivanov had run out of money. Questions were being raised in the art community about why the painting was taking so long. Some people wanted to cut off his support from patrons in Russia. Though a master artist, he was living as a beggar. In defense of his slow pace, Gogol suggests that Ivanov cannot simply paint the image of Christ and the images of the other people as a technical act. Other artists mocked Ivanov’s struggle, suggesting that the real reason the picture wasn’t finished was because he was lazy. It would take Ivanov another 12 years to complete the painting. “The Appearance of Christ Before the People” took 20 years to complete. It became Ivanov’s life’s work. At its initial appearing, the painting received a lukewarm response at best. Ivanov was crushed. He would die a few months after the release of his painting at age 52. After his death, critics began to notice. Eventually, some declared it to be the greatest work in the whole world. Others declared that the hundreds of studies Ivanov painted in preparation for the picture, were masterpieces in their own right. Today it is considered one of the greats in Russian art history. Even as Ivanov prayed for an authentic movement toward Christ, it would seem that he himself entered into the humiliation of Christ. Jesus’s whole life is one of immersion, of baptism, of humiliation. As Paul tells us, “[He] emptied himself, by taking the form of a servant, being born in the likeness of men. And being found in human form, he humbled himself by becoming obedient to the point of death, even death on a cross” (Php 2:7–8). As we remember his baptism, we rehearse his complete identification with humans. St. Gregory Nazianzus defended the doctrine of Jesus complete identification with humanity. In his day, the Apollinarians denied that Jesus had taken a rational human mind. Gregory responded, “For that which He has not assumed He has not healed; but that which is united to His Godhead is also saved.” The baptism of Jesus is one way we remember that Jesus united himself to us, to our broken humanity. In the cross, he entered fully into our death for sin and in the resurrection and ascension, he raised us up into the communion of God: Father, Son and Holy Spirit. In a few moments, we will “lift up our hearts” and hands in the Great Thanksgiving. This is a physical reenactment of the ascension, of our humanity being lifted up to God in Christ. So today as we celebrate the baptism of Christ, we celebrate our union with Christ. During baptism, we rehearse and retell the story that we are united with him in death and raised up with him to new life. Every time we cross ourselves, we rehearse afresh our baptism into Christ’s life, death, resurrection and ascension. In this way, the church often speaks of our baptism and confirmation as an ordination, as being set apart into the priesthood of all believers. What a perfect way to being our journey as St Brendan’s. By remembering our baptism in Christ. We gather in Christ, we serve together in Christ, we seek to love and pray for our community in Christ. Just as Christ immersed Himself the very life of the world, we seek to follow Him into Maryville, Alcoa and all of Blount County as servants, as lovers, as people blessed by Christ and bringing His blessing to the world. We go forward like St Brendan the Navigator. In the early sixth century, He went out with a band of fellow monks in search of the Holy Island. As I’ve thought about his story, it seems that the Holy Island is much like the Beatific Vision that St Augustine talks about. It is a search of love for the Savior who has called us to himself. Augustine felt like our whole life is characterized by the longing and seeking for the love that has taken hold of us. In the story of St. Brendan, they set out in a boat in search of this love. Like all the Celtic travelers who would follow in their steps, they set out on pilgrimage for the love of God. They experienced all sorts of adventures along the way, and they marked their journey by celebrating the feasts of the year. In other words, they marked time by remembering and rehearsing the story of Jesus Christ and his redeeming work. In a culture that marks time by in seconds and even nanoseconds, we feel the pressure of constant performance, constant striving for more success, constant consumption, constant seeking for social status. But we could live a different way. Like St Brendan and the people of God from across the ages, we can live within our culture while continually turning and returning to the story that animates our lives, the story of God’s people and the culmination of that story in the life, death, resurrection and ascension of Jesus Christ. Now one last thought on the baptism. Jesus humbles himself in obedience to the Father. In this humbling, the Father exalts him. In Matthew’s Gospel, we see an apocalyptic moment after the baptism when the heavens are revealed and the Spirit descends like a dove and a voice from heaven proclaims, “This is my beloved Son, with whom I am well pleased” (Mt 3:17). For a brief moment, we catch a glimpse of the ever-flowing love of Father, Son and Spirit. Jesus’ whole life will be a revealing of that love. There is no secret god behind Jesus. In him, we behold the express image of the Father, the love of God poured out for the world. In the great humiliation of our Savior, there is also great exaltation and great joy revealed in the Triune God. In and through Jesus Christ, we enter this movement of humiliation and exaltation, being lifted up into righteousness, peace and joy of our Lord. We pray that as we follow him in the way of baptism, in the very pattern of immersing ourselves into our families and communities around us, we might become living reflections of His love poured out for the world. Nikolai Vasilevich Gogol. Selected Passages from Correspondence With Friends (English translation). Vanderbilt University Press: Nashville, TN (1969). Paul Valliere. Modern Russian Theology: Bukharev, Soloviev, Bulgakov: Orthodox Theology in a New Key (Kindle Locations 630-633). Kindle Edition. Benedict XVI, Homilies of His Holiness Benedict XVI (English) (Vatican City: Libreria Editrice Vaticana, 2013). Gregory Nazianzen, “Select Letters of Saint Gregory Nazianzen,” in S. Cyril of Jerusalem, S. Gregory Nazianzen, ed. Philip Schaff and Henry Wace, trans. Charles Gordon Browne and James Edward Swallow, vol. 7, A Select Library of the Nicene and Post-Nicene Fathers of the Christian Church, Second Series (New York: Christian Literature Company, 1894), 440.